5 Stocks: Potential 5-Baggers in 5 Years Report is Released! We are glad to inform you that we have released 3rd Issue of our Special Report Update 5 Stocks - Potential 5-Baggers in 5 Years today, 5th June 2016 and shared with our Hidden Gems, Value Picks and Wealth-Builder members. Our 3rd Issue of Special report contains performance update of 5 companies which were recommended in our 2nd Issue of this report published last year on 3rd May 2015. We have also evaluated results of last financial year of these companies and suggested necessary action with hold / sell / buy update. Report also covers company's background, recent updates and developments, investment rationale along with our views and recommendations. Moreover, report also includes update on any exclusion of existing stocks or inclusion of new stocks to ensure that these stocks can deliver 5 times returns over a period of 5 years. As illustrated in table below, if these 5 companies generate returns on your investment @ 38% annually, your investment will be 5 fold in period of 5 years. Even if we take conservative scenario considering that only one out of five achieve CAGR of 38% and remaining four delivers CAGR of 20%, your investment will be trebled (3 times) in period of 5 years which is also good compared to returns from any other asset classes like Fixed Deposits, Real Estate, Precious Metals – Gold / Silver or even major indices - Sensex and Nifty. However, our team while selecting these stocks was confident enough to achieve 5 times returns in period of 5 years by monitoring performance of these companies every year and taking corrective measures in case any of them does not perform up to our expectations. Market leader in the business / any one segment in which the company is operating in. Manageable debt on books with healthy cash flows. CAGR of above 15% with increase in operating and net profit margins in last 5 years. Increasing EPS, low PE ratio with ROE and ROCE above 20% in last 5 years. Each parameter is equally important and plays a vital role to ensure that you get healthy returns on your investment with limited downside risk in long term. Stocks selection in our special report 5 Stocks - Potential 5 Baggers in 5 Years is done on the basis of fundamental analysis considering above mentioned parameters. One of the important key to successful investing is to pick the right business at decent valuations. Once you buy shares, you own a part of company’s business. We at Saral Gyan recommend good businesses to buy with long term view and any change in our stock views will be based on strong structural trend and not on any short term movement. We are pleased to inform you that our carefully picked 5-Bagger Stocks have delivered average returns of 26.37% against Sensex returns of -0.62% (27011 - 26843) and Nifty returns of 0.47% (8181 - 8220) in last one year, hence outperformed Sensex and Nifty by 26.99% and 25.90% respectively. Moreover, these stocks have also outperformed Small Cap Index by 24.50% and Mid Cap Index by 16.98%. One out of our five 5-Bagger stocks have not performed up to our expectations giving negative returns as indicated in table above. Remaining ones have performed much better outperforming all major indices in last 12 months. In our 3rd issue of Special Report released today on 05 June 2016, we have informed our members what strategy needs to be followed going forward with these 5 stocks in terms hold / exit / buy or add on dips update. We would like to inform our readers that our 1st Special Report titled 5 Hidden Gems Stocks - Potential 5-Baggers within 5 Years was released by our research team on 26th July’13, it was the time when there was lot of pessimism around the market and we find it as one of the best time to invest in some of the fundamentally strong small cap companies. Later in April 2014, we released update on our 5 Hidden Gems - Potential 5-Baggers within 5 Years report in which we included company’s performance, updates and development in these companies along with our views and recommendation with buy / sell / hold decisions and also the fair price range to accumulate these stocks. Update on this report was published in April'14 which we shared with all our Hidden Gems and Wealth-Builder members. We are glad to inform that all 5 Hidden Gems stocks selected by us have given astonishing returns in the range of 210% to 520% within 2 years and investment made by our members in these stocks were multiplied by 4.5 times. As our objective was almost achieved in 2 years, we decided to make our report public. This report also helped our readers to understand the potential of investing in good companies in bad times with a long term view. Average returns of our 5 Hidden Gems as on 23rd Apr'15 was 353% compared to Sensex returns of 40% (19748 to 27735) and Small Cap index returns of 105% (5516 to 11310) since 26th July’13. Our 5 Hidden Gems stocks have outperformed small cap index by 248% and Sensex by whopping 312% within 2 years. Moreover, one of the Hidden Gem stock of 2013 (Ador Fontech) which we replaced by another stock (Atul Auto) in April 2014 proved to be a good decision as Atul Auto has delivered returns of 212% in last 1 year. As target of 5 times returns was almost achieved within 2 years, our Special Report Update was made publicly available. 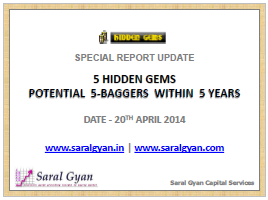 Click here to Read/Download our old Special Report Update - 5 Hidden Gems Stocks - Potential 5-Baggers within 5 Years released on 20th April 2014. Last 12 months were not so good for Indian equities, stock prices which were on rise till March last year with significant increase in retail investors participation compared to previous years started falling with correction in major indices during later part of the year. In beginning of 2016, with lot of pessimism building around equity market globally, we have seen a severe correction in Indian equities during Jan and Feb this year with major indices - Sensex and Nifty falling by more than 24% from all times high made in March last year. If we look into broader markets, stock prices of many mid and small cap companies have seen a steep fall in the range of 30% to 50% or even more in first 2 months of 2016. In such situation every investor looking to create wealth is confused whether to exit, hold or enter the stocks and at what levels to enter or exit. Later in the month of March and April, we have witnessed strong rally on positive global as well as local cues. Factors like positive Union budget with focus on fiscal discipline, change in Fed views regarding US rate hike, stability in commodity prices and positive monsoon forecast helped major indices, Sensex and Nifty to rise by more than 19% from their recent lows made in last week of Feb this year. However, if you are a long term investor, you must avoid timing the market and invest systematically. Any severe downfall in market must be to start accumulating high quality companies with strong fundamentals to get rewarded in long term. In an effort to ensure that our members get rewarded getting better returns on their investments in medium to long term by investing in good quality small and mid cap companies, we published our 2nd Issue of Special Report - Potential 5 Baggers in 5 Years on 3rd May 2015. 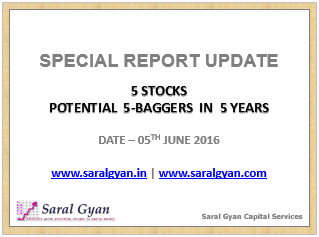 Now after reviewing these 5 companies based on their performances in last financial year and to take corrective action, we have released 3rd Issue of Special Report 5 Stocks: Potential 5-Baggers in 5 Years Update today, 05th June 2016. If you wish to receive our Special Report 5 Stocks : Potential 5-Baggers in 5 Years Update (released today, on 05th June'16), simply subscribe to Hidden Gems, Wealth-Builder, Value Picks or any of our Combo Packs and we will send you the report without any extra charges! You can avail attractive discounts on our combo packs, click here for details. So what are you waiting for? Simply subscribe to our services at discounted price and grab 3rd Issue of our Special Report 5 Stocks - Potential 5-Baggers in 5 Years Update for Free! You can subscribe to our services online using debit / credit card or net banking facility by simply click on SUBSCRIBE! link. In case if you are not comfortable in subscribing online, click here to check out our other payment options and bank details. IMP Note: Hidden Gem and Value Pick report of May 2016 is still not released and will be released by 2nd / 3rd weekend this month. If you have any queries, simply write to us. We will be delighted to assist you!